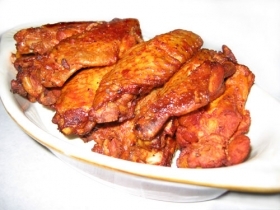 Have you made Bronzed Chicken Wings With Young Ginger? 1. 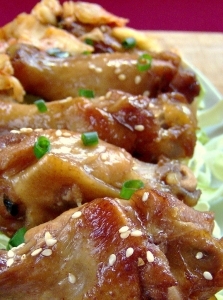 Cut wing tips off chicken wings. 2. Place in shallow baking dish. In small bowl, stir together corn syrup and soy sauce. 3. 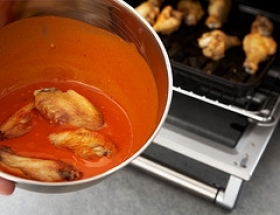 Pour over chicken wings; toss to coat well. Marinate 30 minutes. 4. Drain; reserve marinade. In large heavy skillet, heat corn oil over medium heat. 5. 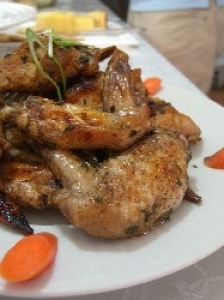 Add chicken wings and ginger; stir fry 2 minutes. 6. Stir in reserved marinade and sherry. 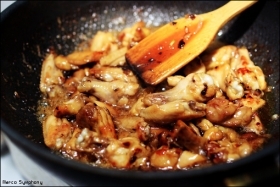 Add mushrooms, bamboo shoots and green onions; stirring frequently, cook 2 minutes. 7. Add chicken broth. Bring to boil. Reduce heat; cover and simmer 20 minutes or until tender. 8. 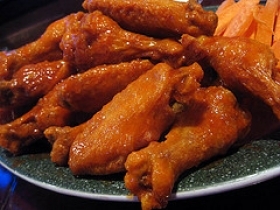 Remove chicken wings to serving platter, keep warm. 9. Stir together cornstarch and water until smooth. 10. Stir into skillet. Stirring constantly, bring to boil over medium heat and boil 1 minute. This recipe contains potential food allergens and will effect people with Soy, Mushroom, MSG, Poultry, Corn, Sulfites, Spring Onion, Alcohol, Onion allergies.